*Original story available on WKU News. Please visit https://wkunews.wordpress.com/2015/05/14/irh-outreach-2015/ to be taken directly to the story. During the 2014-2015 academic year, students from WKU’s College of Health and Human Services (CHHS) and staff at the Institute for Rural Health (IRH) provided more than 600 services at the J.M. Smucker Corporation in Scottsville as part of the IRH’s worksite wellness outreach. IRH staff, along with 28 baccalaureate nursing students, provided health screenings for Smucker employees including: blood pressure, lipid panel, blood glucose, hemoglobin A1C, bone density and BMI. Collaboratively, baccalaureate and graduate public health students developed and provided educational presentations during this time on topics including: oral health, breast cancer awareness, prostate cancer awareness, ergonomics, physical activity, healthy eating, and stress management. One such presentation, a PowerPoint on proper worksite ergonomics, was requested for continued use on-site via Smucker’s telecommunications screens. The health events provided at J.M. Smucker Corporation allow CHHS students a great opportunity to put into practice what they have learned in the classroom. Julia Tabor, the company’s Registered Health Nurse, speaks highly of the corporation’s commitment to employee health and wellness and strives to meet that commitment through the partnership with the IRH. She values disease prevention and health education within the worksite context. “I enjoy the opportunity to share with our future health providers an experience within an occupational health setting,” Tabor said. The IRH staff welcome the students that participate in IRH outreach each year recognizing the students provide unique and valuable contributions, new perspectives, most recent knowledge, enthusiasm and skill. Moreover, the students assist as the IRH seeks to improve the health of the community. The students served more than 150 Smucker employees, resulting in over 160 student engagement hours at one facility. Learn more about the Institute for Rural Health’s outreach at http://www.wku.edu/irh/. 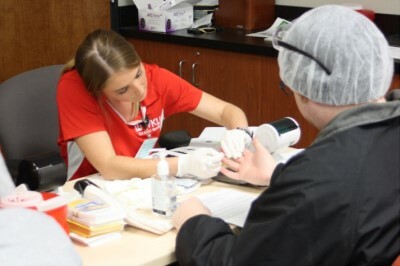 Students from WKU’s College of Health and Human Services and staff at the Institute for Rural Health provided health screenings and educational presentations at the J.M. Smucker Corporation in Scottsville as part of the IRH’s worksite wellness outreach.